With the announcement of the proposed rule, the M&M acronyms are quickly becoming top of mind for health care executives. In the long tradition of producing acronyms at a frightening pace, the health care industry has succeeded in producing two more that are rolling off the lips of executives with greater frequency: MACRA (the Medicare Access & CHIP Reauthorization Act) and MIPS (Merit-Based Incentive Payment System). MACRA is probably best known as the "permanent doc fix," or the legislation that repealed the much-maligned sustainable growth rate formula. With its passage last year, MACRA accomplishes something else as well—it will basically transform the way in which Medicare reimburses for physician services. "It is going to revolutionize how physicians are paid by Medicare," says Jonathan Burroughs, MD, MBA, FACHE, FAAPL, president of Burroughs Healthcare Consulting Network. On April 27, the Centers for Medicare & Medicaid Services (CMS) released its proposed rule, sparking comments from nearly every sector of the health care industry and beginning the 60-day period for detailed review and comment on the proposals. CMS will accept comments until June 27. MACRA introduces two value-based payment (VBP) tracks for physicians: MIPS and alternative payment models (APMs). MIPS essentially incorporates three pay-for-performance programs that are already under way—meaningful use, the Physician Quality Reporting System (PQRS), and the physician VBP modifier—and adds a new component called clinical practice improvement. The proposed rule builds on the legislative requirements and provides details on the MIPS and APM programs. It also adds some attestation requirements for users of certified EHR technology, having to do with cooperation with Office of the National Coordinator for Health Information Technology oversight and not blocking data exchanges. • EHR use, now called "Advancing Care Information" (25% of total adjustment). The financial impact of the MIPS scoring system may be "very significant" for a provider, says Tom Lee, PhD, founder and CEO of SA Ignite, a developer of analytics tools designed to help providers track and report components of complex value-based programs such as meaningful use and MIPS. In fact, the range of potential payment adjustments for a provider (or group) based on performance against the MIPS measures could range from -4% to 12% in 2019 and reach -9% to 27% in 2022, not counting an additional bonus of up to 10% for exceptional performance. • an increasing percentage of payments linked to value through Medicare or all-payer APMs. Participation in an APM will eliminate the MIPS-based payment adjustments. Instead, providers will receive a 5% bonus payment for participation in qualified APMs. Is everyone prepared for MACRA and MIPS? "I think there are a lot of people who don't understand that this is a game changer," Burroughs says. "Organizations today are going to have to change their care models and change their business models—and they'll have to coordinate the two." Given that MIPS payment adjustments and APM incentive payments aren't set to begin until 2019, many providers may have a false sense of security. "I have a client who asked me why he should be doing anything today if MACRA isn't going into effect until 2019," Burroughs says. "I had to tell him that the data they are going to use to pay him in 2019 are based on 2017 performance, which means that in about seven or eight months he'll have to be in a different model so he can have the kind of data that are going to optimize his reimbursement." Lee says federal officials have made it a point to raise awareness about MACRA and MIPS, noting that representatives from CMS mentioned them frequently at the annual HIMSS conference in early March. "What is lacking, though, is a real deep and working-level understanding of the primary tenets of MACRA and MIPS," he says, adding that there's a level of fear and uncertainty accompanying MACRA. Much of that fear has to do with the financial implications of the legislation, Lee says. That 9% penalty "can be huge when you're thinking about an organization's Part B Medicare payments," he points out. "This is obviously a world of single-digit operating margins, so this is what initially gets people thinking that they have to get their heads around [MACRA]." Lee believes the hospital leaders in charge of programs such as PQRS and meaningful use are the most likely to voice concerns about MACRA. "And then that starts getting up to the executive level," he says. "And then they start seeing the basic information about the impact of MIPS—where if you look at the top/bottom swing of the impact you can get a 36% variability [-9% to 27%], which is four or five times greater than you would ever get from the original meaningful use and PQRS programs alone. That is pretty eye opening." Lee says providers also must be cognizant of how MIPS scores are going to be reported to consumers. MACRA requires that each physician's composite MIPS score be posted to Physician Compare, a website created by CMS to provide consumers with objective measures of physician performance. CMS has verified in the recently released MACRA proposed rule that January 1, 2017, will be the start date of the first MIPS performance year. "So although the MACRA and MIPS legislation passed last spring, a lot of the details are still bring fleshed out and people are holding their breath waiting for what the final rule will say," Lee says. "And when it comes out, it will be an extremely hot topic and answer a lot of questions: 'How will MIPS work?' 'Will I have to change my processes, my staffing, and my budgeting?' And 'What am I at risk for, and what's the upside?'" In January, Andy Slavitt, acting CMS administrator, caused quite a stir within the health care community when he told investors at the annual J.P. Morgan Healthcare Conference that the meaningful use program was essentially coming to an end. "Now that we effectively have technology into virtually every place care is provided, we are now in the process of ending meaningful use and moving to a new regime culminating with the MACRA implementation," he said. One of the measurement categories the proposed rule includes is Advancing Care Information, which replaces meaningful use. "Our goal with Advancing Care Information is to support the vision of a simpler, more connected, less burdensome technology," wrote Slavitt and Karen DeSalvo, national coordinator of the Office of the National Coordinator for Health Information Technology, in an April blog post. "Compared to the existing Medicare meaningful use program for physicians, the new approach increases flexibility, reduces burden, and improves patient outcomes." Advancing Care Information, which would include fewer measures than the current meaningful use program, allows eligible clinicians (ECs) to earn 50% of the allocated points simply by reporting on measures. And—as an example of what Slavitt and DeSalvo said is the increased flexibility of the program—the other 50% of the score will depend on the ECs' performance on those measures, with the proviso that they can choose to focus on those measures most meaningful to their practices. "So there is a little bit more flexibility on how well you might perform on each measure," says Naomi Levinthal, MS, MA, an HIT consultant with the Advisory Board Company. "You could be a provider that wants to target a few measures that would get you to 100% of the performance rate for those measures, while you could essentially ignore doing well on some of the other measures. "What has essentially happened with this rule is that CMS has reversed course on the efforts they put into place to align both the hospital and eligible provider sides of meaningful use," she continues. " And if you are a health system that has to attest on behalf of physicians in a Medicare and Medicaid meaningful use hospital, it becomes much more administratively complex—and the same would go for a large physician practice that may participate in the Medicare and Medicaid side of meaningful use." In their April blog post, Slavitt and DeSalvo emphasized that Advancing Care Information affects Medicare payments only to physician offices, not Medicare hospitals or Medicaid programs. "We are already meeting with hospitals to discuss potential opportunities to align the programs to best serve clinicians and patients, and will be engaging with Medicaid stakeholders as well," they wrote. Levinthal notes that even if the rule is finalized, "nothing is going to change for 2016. You still have a year-long reporting period, and you still need to do all of it." Under MACRA, much like in the meaningful use and PQRS programs, organizations will be required to gather and report data. "Those requirements are not going away," points out Dave Wofford, senior manger with ECG Management Consultants. "And, if anything, this is going to be more challenging." For example, organizations may be asking program directors and managers to predict performance under these incentives, "which will be difficult to do," Wofford says. "And these organizations are going to have to think about how they are going to maximize their performance under these incentives," he adds. "They will have to make strategic decisions around which incentives they want to focus their attention on because they won't be able to focus on all of them at once. They need to understand how these programs work so they can determine where they can win. How and where they focus their efforts on improving their performance will be very critical." To prepare for the arrival of MACRA/MIPS, Lee recommends organizations take four steps to ease the transition. The first is simple and straightforward. "Organizations have to get started right away, which means getting the information that's been approved by Congress that will not change with the rulemaking that's going on right now," he says. "This legislation was approved by a 92–8 margin in the Senate, so we know it's going to stay in place." According to Stanley Nachimson, principal of Nachimson Advisors, organizations should do a thorough review of the proposed rule to first understand the proposals, then comment on areas that CMS is looking for input on (specified in the proposed rule), and then begin the preparation for moving to either MIPS or an APM. "The final rule is expected out this fall—that gives organizations only a short time to react," Nachimson says. "Remember also that the current systems' payment adjustments (meaningful use, VBP, PQRS) remain in place through 2018." Lee says the approved measure focuses on the financial implications of the legislation and the top-to-bottom risks MIPS poses to organizations. Next, organizations must recognize that in the first year of the transition, 75% of the MIPS score will consist of Advancing Care Information (formerly known as meaningful use) and PQRS components. "So to the extent you can continue to invest in and optimize and rationalize those programs, you will have 75% of MIPS covered as far as the first year of performance," Lee says. Organizations also should be evaluating their budgeting, staffing, and other processes in light of what they already know about MIPS. "Remember this is a competitive program—it's budget neutral," Lee says. 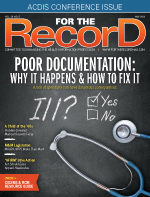 "In meaningful use, everyone could potentially win with the program. But this is where winners can take from the losers." For example, if an organization determines it's not doing well on measures related to PQRS, "that will have strong implications about how it is going to budget, staff, and design processes," Lee says. The final step in preparation is the most time-sensitive, Lee says. "If you look at 2016 as a rehearsal year for MIPS, there are definitely externally imposed guidelines with respect to meaningful use and PQRS that you should be giving thought to," he notes. For example, Lee points out that medical practices have until June 30, 2016, to register to participate in the PQRS Group Practice Reporting Option. Should they elect to submit as a group, they must decide the type of reporting option that works best for them. "And there's a very high probability that under MIPS they will have to face the very same question next year," he says. "What you do now with respect to this year's decision—and where you put a lot more focus on long-term considerations—can give you a running start for next year."